St. Patrick's Day is a great day for getting drunk all over the world. In celebration of the patron saint of Ireland, St. Patrick's Day is a religious holiday and what better to ease the consumption of religion than copious amounts of booze. Falling on a Sunday this year, there is no excuse not to take in the festivities and drink a few pints and have a 'craic'. Learn about when and where to party in your current neck of the woods with this handy guide to St. Patrick's day around the world. Ireland is, as any logical person may expect, the best place to party on March 17th and Ireland's biggest city, Dublin is the epicentre. 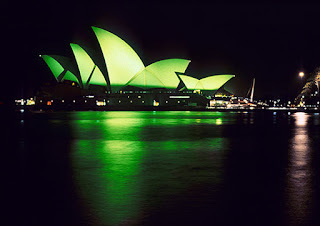 Dublin hosts an annual St Patrick's festival that will run in 2012 from March 14th- 18th. The Festival includes mostly arts and cultural events but for the best every pub in Dublin will be packed on the 17th, especially in the city's famous Temple Bar district. In addition to the publicly funded festival, Guinness throws a bash of its own from the 15th to the 17th at it's Dublin Storehouse. The biggest celebrations outside Dublin are in Downpatrick, County Down, where Saint Patrick is rumored to be buried. Many other cities, towns, and villages in Ireland hold their own parades and festivals, including Cork, Belfast, Derry, Galway, Kilkenny, Limerick, and Waterford. The shortest St Patrick's Day parade in the world takes place in Dripsey, Cork. The parade lasts just 100 yards and travels between the village's two pubs. The longest-running Saint Patrick's Day parade in North America occurs each year in Montreal and has been held in continuity since 1824. Montreal's 2013 parade takes place on March 17th. Canada's other major cities also host parades and celebrations. More than a week of celebrations dubbed CelticFest takes place in Vancouver from March 9th-17th 2013 with a parade on the final day. Toronto also has a St. Paddy's parade which takes place on the 17th, which means one could easily travel to the attend both the Toronto and Montreal celebrations or alternatively on of the American parades. Guinness has lobbied to make Saint Patrick's Day a national holiday in Canada. Currently, the Canadian province of Newfoundland and Labrador is the only jurisdiction in Canada where Saint Patrick's Day is a provincial holiday and one of only two places outside of Ireland that officially recognize the holiday. Despite the lack of a national holiday, bars and pubs across Canada will be full of green revelers on March 17th. In Argentina, and especially in Buenos Aires, all-night long parties are celebrated in designated streets, since the weather is comfortably warm in March. People dance and drink only beer throughout the night, until seven or eight in the morning,. In Buenos Aires, the party is held in the downtown street of Reconquista, where there are several Irish pubs. Beginning at 6 p.m. on the corner of Arroyo and Suipacha streets, ending in Plaza San Martin. Activities also take place in Plaza Irlanda in Caballito, including a parade at 7 p.m. and performance and celebration from 8 p.m. to 12 a.m.
Irish and non-Irish Americans alike (around 34 million modern Americans claim Irish ancestry) pound pints of beer, either dyed green or naturally black on March 17th. Saint Patrick's Day is widely celebrated in the United States and it is one of the leading days for consumption of alcohol in the United States, and one of the busiest days of the year for bars and pubs. Many people, regardless of ethnic background, wear green clothing and items. Traditionally, those who are caught not wearing green are pinched affectionately. The New York parade is largest Saint Patrick's Day parade in the world and is also the oldest civilian parade in the world. 150,000 marchers participate in the parade while more than 2 million spectators line the streets. The parade marches up the 1.5 mile route along 5th Avenue in Manhattan, is a five hour procession, and is always led by the U.S. 69th Infantry Regiment. Unlike many official celebrations outside of Ireland, N.Y.'s parade takes place on Sunday, March 17th, 2012 and begins at 11:00 a.m..
Boston has a long-standing Irish tradition and much of the cities population claim Irish roots. In Boston, Evacuation Day is celebrated as a public holiday for Suffolk County. While officially commemorating the British departure from Boston, March 17th was made an official holiday after Saint Patrick's Day parades had been occurring in Boston for several decades and is often believed to have been popularised because of its falling on the same day as Saint Patrick's Day. Boston's largest parade takes place on March 17th in South Boston, beginning at 1pm. 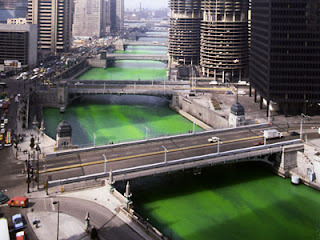 Chicago's St. Patrick's Day celebration is, perhaps, best known for the dying of the Chicago River. They dye the Chicago River green on the Saturday before St. Patrick's Day, though these days an eco-friendly dye is used rather than the chemicals of years past. Sunday March 17th is also the day the Windy City holds its St. Patrick's Day Parade The parade kicks off at noon, but if you want to watch the river being dyed, you'll need to be in place by 10:45 a.m.
New Orleans has maintained a large population of Irish heritage, and Saint Patrick's Day traditions going back to the 19th century, including multiple block parties and parades. Major parades include the Irish Channel parade (March 17th), the Downtown Irish Parade (March 17th), multiple parades in the French Quarter (March 17th), and a combined Irish-Italian Parade celebrating both Saint Patrick's Day and Saint Joseph's Day(March 9th). As with many parades in New Orleans, the influence of New Orleans Mardi Gras is apparent, with some of the floats being reused from local Carnival parades, and beads and trinkets being thrown to those along the parade route. The Emerald City's downtown financial and retail core celebrates with a parade on Sunday, March 17th. Seattle's Saint Patrick's Day Celebration is the largest and oldest in the Northwestern United States. Along with the annual "Laying 'O the Green" where Irish revellers mark the path of the next morning's procession with a mile-long green stripe, the Seattle parade marks the high-point of Seattle's Irish Week festivities. As closely as Ireland and the UK are linked historically and geographically, it is no wonder that St. Patrick's Day is widely celebrated throughout the whole of the British Isles. Birmingham holds the largest Saint Patrick's Day parade in Britain with a massive city centre parade over a two mile (3 km) route through the city centre. The organisers describe it as the third biggest parade in the world after Dublin and New York and this years parade will take place on Sunday 17th March from 12 noon and will process from Camp Hill to Digbeth. London has an annual Saint Patrick's Day parade which takes place on Sunday, March 17th. A parade begins at Green Park at 12pm and an all day festival takes place in Trafalgar Square. Liverpool, a major port leading to the Irish Sea, has the highest proportion of residents of Irish ancestry of any English city. This has led to a long-standing celebration on St Patrick's Day in terms of music and cultural events in addition to mass drinking. Manchester hosts a two-week Irish festival in the weeks prior to St Patrick's Day. The 2013 Manchester Irish Festival will run from Friday the 8th - Monday the 18th. Launch Night will be at Manchester Town Hall on the First day of the Festival. Saint Patrick's Day is widely celebrated in New Zealand, green items of clothing are traditionally worn and the streets are often filled with revelers drinking from early afternoon until late at night. New Zealand's largest St. Paddy's celebration takes place in Auckland. Auckland's parade, which takes place on March 17th, has become a hallmark event on Auckland’s Queen Street, straight after the parade Aotea Square transforms into a mini music and dance festival. Saint Patrick's Parades are now held in 9 locations across Japan. The first parade, in Tokyo, was organised by The Irish Network Japan in 1992. Asia's largest St. Patrick's Day parade, located on the main strip of Omotesando is closed to traffic on the afternoon of March 17th, when a parade of costumed revellers, marching bands and cheerleaders wends its way up the hill and back again – then off to the nearest pub for a few rounds of Guinness. Seoul has celebrated Saint Patrick's Day since 2001 with Irish Association of Korea. This year's events takes place on March 17th at the D-Cube Plaza in Sindorim on Saturday March 16, from 12.30pm to 5pm. This year’s festival will concentrate on the music and dance performances which people will be familiar with from previous festivals. On the main stage there will be a number of Irish and Korean acts playing traditional and contemporary music during the afternoon. There will also be demonstrations of traditional Irish dancing and a chance for the audience to participate which is always great fun (and does not require previous experience). Wherever you may be in the World you are never very far from an Irish pub, so make sure to grab a pint on the iconic black beer and imbibe the Irish spirit.